It is a fully custom design. 4 pole, 12mm string spacing, with the re-entrant gCEA tuning in mind, meaning that the ‘g’ pole is the right size for a high ‘g’ string. Not only this, but Pete gave a choice of colours, a choice of clockwise/anti-clockwise and a choice of N/S or S/N polarity. If I wanted anything else out of the ordinary, all I had to do was ask. 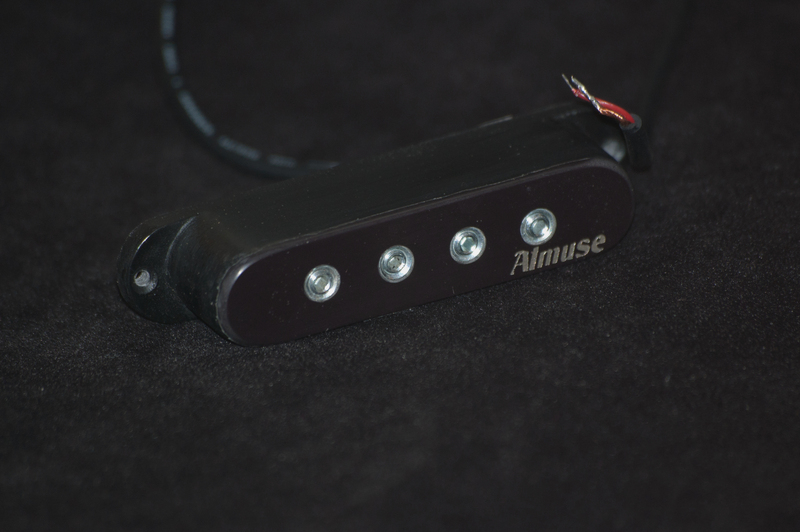 He will happily make you different rated pickups for bridge and neck too, if you are ordering a pair. How cool is that? In addition, Pete also provided one of the hardest parts for me to locate, the 4 string bridge plate. 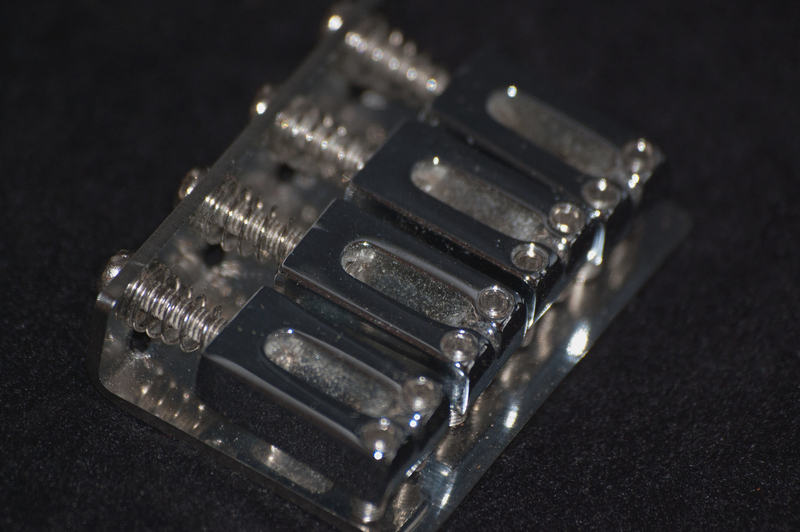 This takes standard Fender style bridge saddles that you can salvage from any ol’ strat or tele bridge, both of which are cheap as chips on ebay now. In the photo here, the saddles are in need of a clean up, but I just screwed them on quickly so you could all see how nice a fit they are. Pete is a real gent and I get the feeling he loves his work. He was happy to help me get all the details right and even offered up some other ideas (more on that in another post). You can get current prices for his stuff from the site, but really don’t be afraid to mail him with your requirements. I just can’t wait to get this all wired up and shredding now. Only I do need to find a body for the Tearcaster uke first. That would seem like the logical thing to do for pt 04. 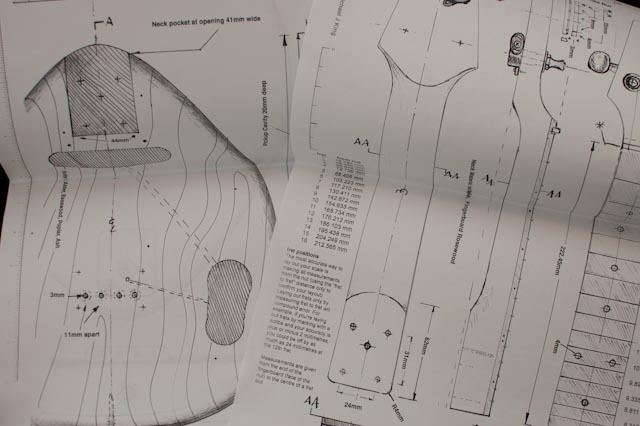 Before starting any ukulele build, your going to need to get a plan! I got my plans from Michael J King, who sells a sets of either printed plans or PDF plans delivered by e-mail. 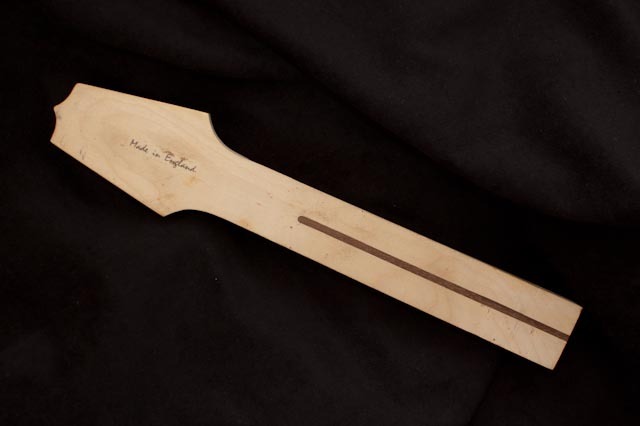 The plans are for a steel strung electric ukulele. 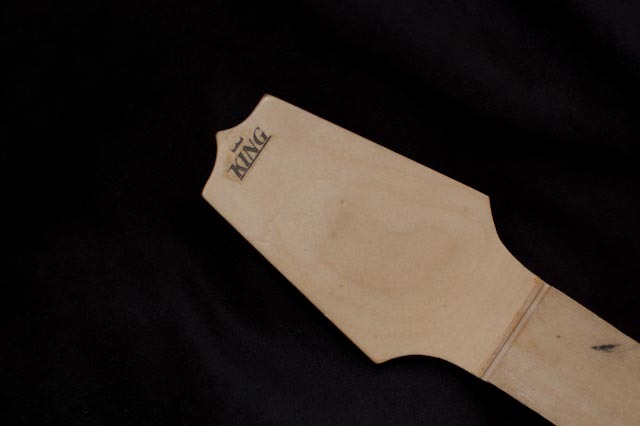 You can chose between soprano, concert or tenor scaled necks when you build. I am going to go for a soprano sized neck for this Uke. 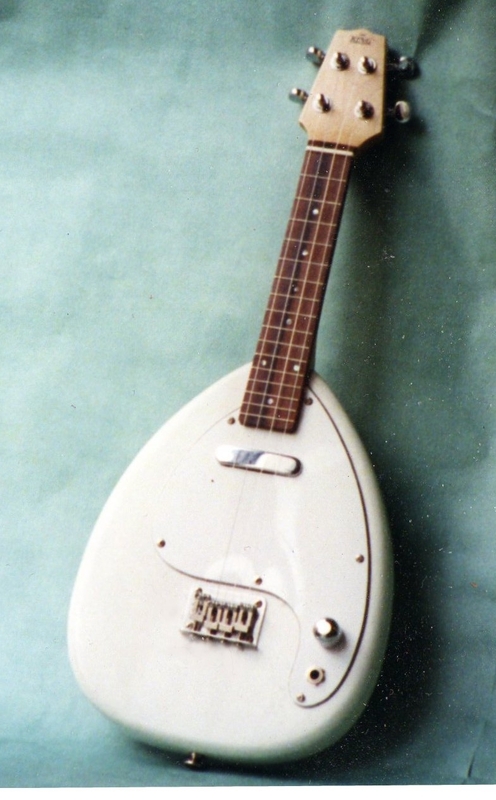 Although the body shape is different, the build principals for this uke resemble that of a fender telecaster or stratocaster. 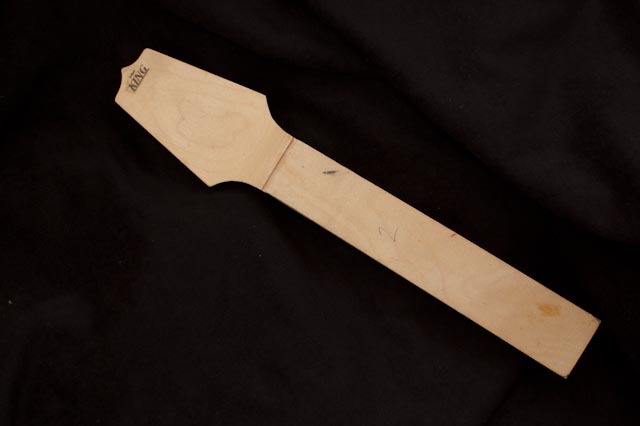 The neck is bolted onto a one piece body with either one or two single coil pickups and a fender style bridge/tailpiece. I could have used strat 6-string parts for the bridge and pickups, but for the best look, I think dedicated 4 string parts should be used. All the other techniques used for the build can be researched in a electric guitar builders book. I will be calling this my ‘Tearcaster Build’ and hopefully when it is finished I will have built something that looks like one of Michael’s own Ukes. Locating timbre for instrument building is no easy task. I think there is only about 4 or 5 suppliers of tone woods in the UK and the prices on their woods are beyond what I have been prepared to pay. Essentially, I am a first time builder, and as such, paying £60 or £70 or £80 just for a block of wood to make a body out of could turn out to be an expensive mistake. You need to spend money on many other things as well. Nobody should expect a home built instrument to cost less than a factory built one of the same kind of quality… It just is not possible. I have been looking at ways to keep prices down though…. Recycling old bits of wood gathered by putting requests out on free recycling web sites such as freecycle or putting speculative bids on lumps of wood on ebay seem to be good ideas, so that’s what I have been doing. Occasionally, I come up trumps. In this case, I defiantly did. 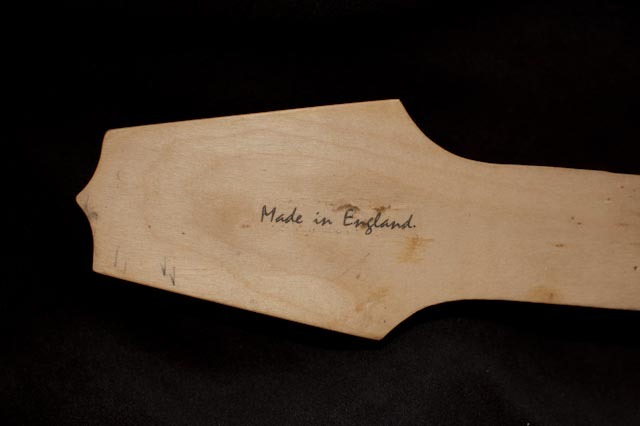 There I was poking around ebay looking for ‘neck blanks’, which are the lumps of wood used to make guitar necks out of when I found, purely by luck, that the same fellow who supplied me the plans for the ‘tearcaster’ uke, Michael J King, was actually selling some bits. I was happy to pay £25 for this neck. He says it is a blank, but a massive amount of the work has been done to shape it already, and I know it will fit, because it is built from the same specs.